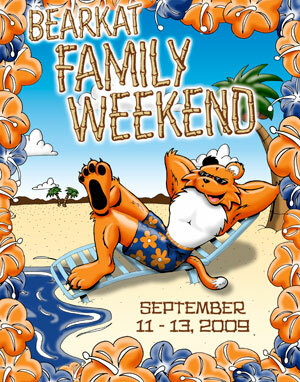 Sam Houston State University will get into the Bearkat mana (spirit) Hawaiian-style and bid an e komo mai (welcome) to more than 2,500 ohanas (families) for this year’s Bearkat Family Weekend. Activities will be held Sept. 11-13, kicking off on Friday with a Project Connect open house from 10 a.m. to 3 p.m. and a Program Council showing of the movie “Land of the Lost” at 8 p.m. Project Connect is a federally-funded program that helps first-generation, low-income and disabled students to graduate from college. “Bearkat Family Weekend is an opportunity for families to see what their students are involved with here on campus and to have a great time,” said Kimberly Spradlin, Dean of Students’ Office program coordinator. “Sam Houston values their students and the trust parents give us with their students. We want to give them the best service for what they’re paying for. Saturday’s activities begin with check in, from 8:30-11:30 a.m. in the Lowman Student Center Mall Area; a “Coffee with Administrators" continental breakfast from 9-10 a.m. in Austin Hall, the oldest building on the SHSU campus; and the Parents' Association Annual Meeting, from 10-11 a.m. in the LSC Theater. Throughout the day, families can meet faculty members and visit departments during various academic open houses, and take guided campus tours at 10 a.m., noon and 2 p.m. at the Visitor Center, according to Spradlin. The addition of an Estill Building Open House and campus tours are two of the major changes to this year’s program and were based on responses from previous years’ evaluations of the weekend. From noon to 2 p.m., SHSU offices, departments and student organizations will host games such as bobbing for apples, Plinko and a bucket toss during the Carnival on the Concourse outside the Bernard G. Johnson Coliseum. Families will be able served a luau of Hawaiian chicken and ham and enjoy a performance by Houston’s Hawaiian Entertainment Productions, inside the coliseum. “The show is fast paced, with lots of island drumming and several authentic and colorful costume changes,” said Chief Savea, a high chief from the Polynesian islands of Samoa and owner of Hawaiian Entertainment Productions. “We'll feature dance and music of major Polynesian islands like Hawaii, Tahiti, Samoa, and Aotearoa (Maoris of New Zealand). “We'll have lots of audience participation so the girls can learn how to do the hula and the boys to do a Tahitian or dance of the other islands and a sing along with some known island hapa haole (part island language, part English),” he said. Saturday afternoon activities will include a classic car cruise-in, from 3:30-5:30 p.m. in the Bowers Stadium north parking lot; the pre-game tailgate party from 4-6 p.m. in Bearkat Alley; and will culminate with the football game versus North Dakota State at 6 p.m. at Bowers Stadium. Sunday morning will round out the weekend with an interdenominational Christian worship service, from 10:30-11:30 a.m. in the Farrington Pit, or in the LSC in the event of rain. Registration for the weekend is $10 per person and $5 for students, which includes a welcome gift at check-in, as well as the continental breakfast, Bearkat luau, the pre-game party and registration for door prize drawings that will be given away during the weekend. The registration deadline is Aug. 28. Tickets for the football game will be sold separately for $25 for reserved seats with a chair back, $15 for general admission, and children under the age of six are admitted to the game for free. Tickets can be purchased online at www.gobearkats.com, at the gate on game day or at the field house until 4 p.m. on Friday. For more information, a complete schedule of events, or to register, visit the Parent/Family Weekend Web site or contact the Dean of Students' Office, at 936.294.1785.